Want to Renovate? Need 203(k) Loan Advice? 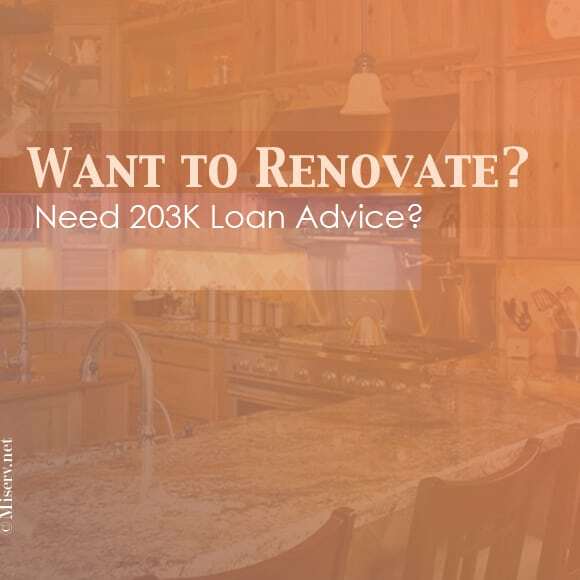 You may be looking for a renovation loan and need some 203K loan advice. You’ve come to the right place! The FHA 203(k) allows you to include the repair/improvement costs in the loan amount on either a purchase or refinance with one closing. The funds for repair or improvement are held in escrow, and are released when the work is completed. The mortgage amount is based on the projected value of the completed project. Encouragement from FHA makes this loan easier and faster to close than ever before. What Are the Advantages of a 203(k) Loan? Any 1-4 unit properties which have been completed (with a certificate of occupancy) for at least one year. The properties must be acceptable according to the provisions of local zoning requirements. You may rehab homes that have been demolished or razed as a part of the rehabilitation process. However, you must keep part of the original foundation. You may move a home onto a foundation on the mortgaged property. But the proceeds from the sale of the previous location cannot be released until the foundation is properly inspected. Furthermore, the home must be satisfactorily attached to the new foundation. Property conversions. The buyer can convert a property from single family into a 2-4 unit, or from a 2-4 unit to a single family unit. The max is a 4 unit property. One unit must be owner occupied. A manufactured home that was built AFTER June 15, 1976, and has been on a permanent foundation for over one year. The unit must have been delivered to the site when it was new, prior to being occupied. 7. Cooperatives are NOT eligible. * Structural repairs and alterations. Includes such items as additions to the structure, repairing any and all structural damage. * Improvements in functionality or modernization. Includes such items as remodeled kitchens and bathrooms. * Changes for aesthetic appeal, and the elimination of obsolescence. * Repair or replacement of plumbing, heating, air conditioning or electrical system. The buyer may install new plumbing fixtures, including interior whirlpool bathtubs. Must be installed or repaired prior to beginning any other repairs to the property. Properties less than one acre in size can be limited on this item. New double pane windows and doors, storm windows, insulation, solar domestic hot water systems. property from erosion. Tree removal is also acceptable it the tree presents a hazard to the occupants. Fencing, new walks and driveways, and general landscape work (trees, shrubs or seeding). Repair of a swimming pool, up to $1,500. You cannot include items that will not become a permanent part of the property. You may not include luxury items. These include, but are not limited to: New swimming pools, exterior hot tubs, saunas, spas, tennis courts, and barbecue pits. Please refer to the HUD website for the most recent Lending Limit. I’m happy to talk to you on the phone!